Left: January 2017. Marine le Pen of the nationalist Le Front National (FN) kicks off her presidential campaign in France. Photo: Thierry LeClercq via Flickr; cropped. Public domain. Right: Demonstration of the far-right Alternative for Germany (AFD) Party in Mainz, Germany. Photo: Stephan Dinges via Flickr; cropped. CC BY-NC 2.0. 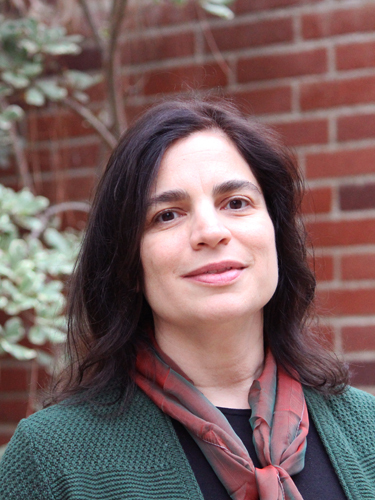 In advance of the April 20th graduate student conference, "Exploring Human Rights in the Shadow of Nationalism," UCLA Professor of Law Aslı Ü. BâlI outlines three contemporary challenges to universal human rights. "Mass atrocity crimes are happening in real time, whether in the case of the ethnic cleansing of the Yazidis in Iraq, the forced dislocation of Kurds in Syria or genocide crimes against the Rohingya Muslims in Myanmar." UCLA International Institute, April 6, 2018 — “The failure to ensure not just a right of exit, but a right of entry, is the basic hole at the heart of the universal human rights paradigm,” said UCLA Professor of Law Aslı Ü. Bâli in a recent interview. A specialist in international and human rights law, Bâli is also co-director of the Center for Near Eastern Studies and faculty director of the Promise Institute for Human Rights at the UCLA School of Law. The legal scholar and political analyst will deliver opening remarks at the UCLA conference, “Exploring Human Rights in the Shadow of Nationalism,” on April 20, 2018. The fifth in a series of “Going Global” conferences organized by UCLA International Institute graduate students, the day-long event will feature a keynote address by Pan DeLargy, former senior advisor to the UN representative for migration, and presentations by graduate students from a variety of disciplinary departments. The conference will also include a panel of top undergraduate students enrolled in Institute academic programs. This article distills an interview with Professor Bâli conducted in advance of the conference. What do you consider the most salient issues in human rights today? I would say there are three major human rights challenges in the world today. The first challenge is the migration crisis and understanding the basic human rights failure to ensure not just a right of exit, but a right of entry. The universal human rights paradigm says that everyone is entitled to human rights and protections, but it doesn't offer an actual avenue by which people can access those protections when they're denied them in their country of nationality. The asylum system we have today is insufficient; the distinction between refugees and economic migrants is largely indefensible from a human rights perspective. For the most part, the conditions that give rise to economic migration are a consequence of man-made humanitarian crises and human rights deprivations. Conditions of extreme inequality that leave people unable to meet subsistence needs are themselves often the product of decisions made by authoritarian governments that distribute resources in such a way as to make life utterly unsustainable for vast numbers of people in many territories of the world. Trying to trap people in such circumstances is a fundamental abrogation of the promise of human rights. September 29, 2016. 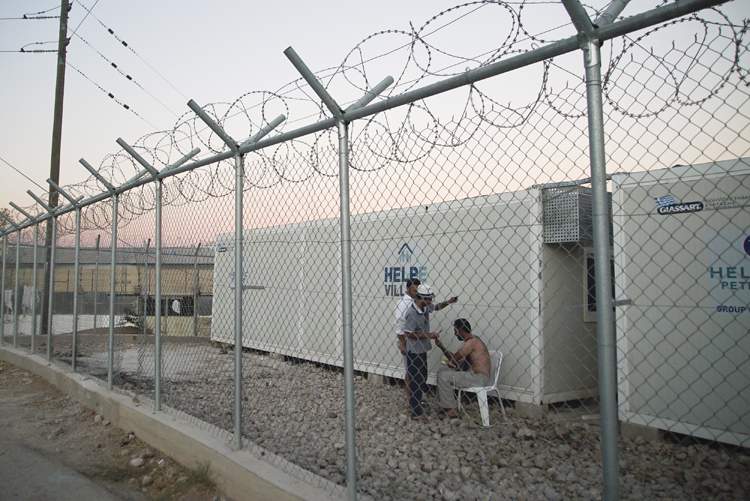 Inhabitants of Suda refugee camp, seen through the barbed wire fence surrounding it, in Chios, Greece. Photo: Mstyslav Chernov via Wikimedia Commons; cropped . CC BY-SA 4.0. The second largest challenge is the basic failure to honor the claim, "Never again," in connection with genocide. Mass atrocity crimes are happening in real time, whether in the case of the ethnic cleansing of the Yazidis in Iraq, the forced dislocation of Kurds in Syria or genocide crimes against the Rohingya Muslims in Myanmar. The longstanding claim that "Had we known, we would have intervened," has been put to the test time and again and has been refuted in each instance. We might not have had contemporaneous media accounts of early 20th-century genocides, but we have very detailed knowledge of contemporary early 21st-century genocides that has been disseminated around the world and it has done nothing to prevent them. We know of crimes against humanity and acts constituting genocide in real time and still cannot generate the political will to stop them. 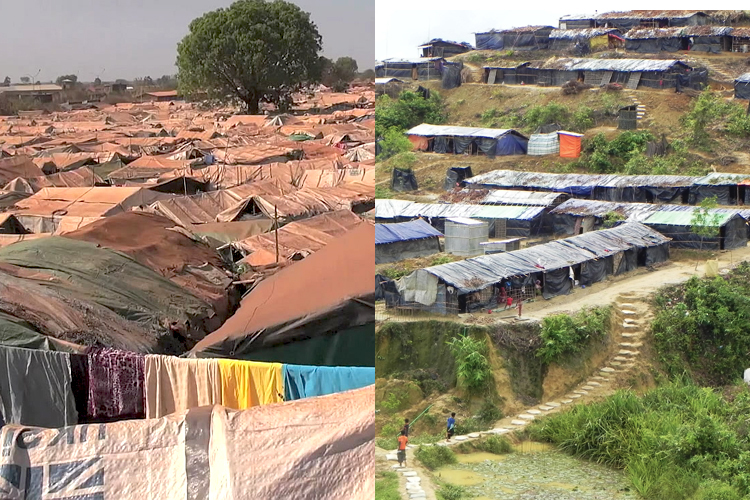 Refugee camps in Wau, South Sudan (left) and Cox's Bazar, Bangladesh (inhabited by Rohingya Muslims from Myanmar. Photos, left: Jill Craig/ Voice of America; public domain. Right: Maggie Moore/ USAID, cropped. CC BY-NC 2.0. Number three is the displacement of human rights frameworks by the global counterterrorism paradigm, particularly in the United Nations system. The United States — one of the principal authors of the human rights commitments at the heart of the United Nations system when it was first conceived in the post-WWII context — led the charge to re-orient the work of the UN Security Council around counterterrorism post-9/11. The consequence was the dissemination through the UN Security Council of a new paradigm that enables countries around the world to concentrate power in the executive, expand surveillance of their citizens and use the rhetoric of terrorism to describe their internal enemies. This counter-terrorism model eventually gave rise to significant domestic resistance on civil liberties grounds within the U.S. What is less well understood is the degree to which the United States has created a playbook that has been taken up by authoritarians around the world in countries without any of the same resources for resistance. So when you take these three things combined — the failure to protect the right of entry for individuals seeking to flee inhumane circumstances, the idea that genocide and "never again" remain an utterly unfulfilled promise in the international community, and the emergence of a counterterrorism paradigm providing a universal language to legitimize human rights violations — they represent formidable challenges to the protection and advancement of human rights. Can you speak about the threat of nationalism to basic human rights at this moment? The upcoming conference looks at human rights in the age of nationalism. Indeed, we are witnessing a period of turbo-charged nationalism in an age of counterterrorism. When you give governments the power to redefine their enemies in the language of counterterrorism, you create a potent and dangerous instrument with which to eviscerate the ordinary protections of human rights, particularly for those who are cast as foreigners and outsiders through a nationalist lens. Deploying the counterterrorism paradigm to exclude those fleeing human rights violations and atrocities — trapping people under dire threat in Syria, for example, or in Central America, Yemen, the Democratic Republic of the Congo, and elsewhere — is the very antithesis of the universal obligation to respect and protect human rights. Yet the language of exclusion is also an expression of resentment that is being generated by acute inequality in the Global North. The nationalism that we're seeing worldwide at the moment is a populist, or popular, response to the unequal impact of globalization. People who see their own fortunes declining as a relative matter nationally, and also as a relative matter internationally, are engaging in a backlash. A readily available means of expressing that backlash and finding an "other" to blame is the language of nationalism. What kind of grassroots action can counter the forces of nationalism? Grassroots efforts that seek to address this new wave of nationalism must begin by properly diagnosing its root causes. What’s giving rise to these idioms of protectionist nationalism is, at base, the structural inequality laid bare following the financial crisis of 2007. A critical strategy for addressing this problem is re-investing in social democracy in ways that mitigate the intense inequalities wrought by globalization. Of course that is a very tall order, all the more so when racialized and often anti-democratic strategies of exclusion are offered up as a panacea to all ills by entrepreneurial politicians. Our conversations in the Going Global conference will, I hope, begin to shed light on the different available strategies to effectively counter the nationalist threat to human rights protections in Europe, the United States and beyond.